Right-hand bat; Right arm medium-fast bowler. Kyle, now aged 26, joined the club in 2009, having spent some time at Vauxhall Mallards as a youngster. He immediately showed potential as an opening or first-change bowler and played regularly in the B and C Teams. In 2011, Kyle bowled 61 overs for the Cs, taking 10 wickets but a change of job meant that he was not available regularly at weekends for a few seasons. 2016 proved something of a breakthrough season for Kyle. Regular availability and a chance to open the bowling for the B Team saw him find a bit of consistency to go with his pace and enthusiasm. 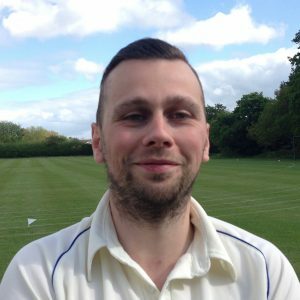 He took 14 wickets and earned promotion to the As and also turned in a man-of-the-match performance in the final of the Wicklewood Shield, his 5-16 helping Melton defeat Eaton. While a little unorthodox with the bat, Kyle also showed that he has a good eye and can strike the ball hard. His 44, last season, is his highest score to date and, like all bowlers, he bemoans his lack of opportunity as a batsman. His first game of 2017 will be his 100th appearance for Melton, and he’s taken 83 wickets. A few years ago he found a novel way of getting onto the Park – by driving through the hedge! Luckily neither he, nor the hedge suffered any lasting damage.